What if you discovered one of your media channels was 68% more productive than you thought? American Express Canada realized just how important mobile was after working with its agency, Mindshare Canada, and DoubleClick to accurately measure cross-device conversions. Amex Canada's acquisition team has one goal: find new card members. They've had good success with desktop search and display ads, so the team wasn't particularly compelled to try mobile advertising. "Using last-click measurement, it was difficult to see evidence that exposing prospects to mobile ads had a significant impact on application conversions," said Roberto Passarelli, senior manager in digital marketing at American Express Canada. 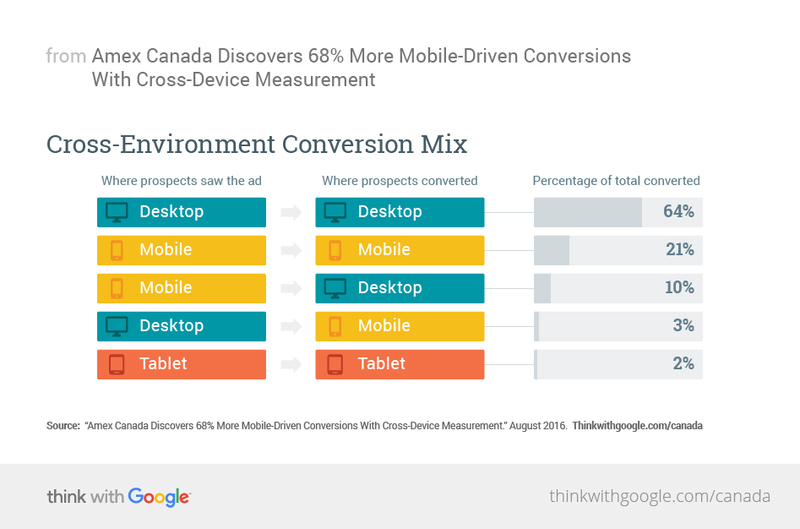 But with evidence that more and more Canadians are relying on their smartphones, Mindshare Canada and Amex decided to dive deeper into consumer mobile activity using DoubleClick's cross-device measurement features. "We knew that consumers switch between screens to complete tasks. And many of the conversions driven by mobile actually occur on desktop," said Eleni Pappas, digital trading director of Mindshare. So they put mobile ads to the test. Amex and Mindshare Canada's programmatic mobile banner ad campaign drove prospects to Amex's newly redesigned mobile landing pages. This allowed people the opportunity to learn more and start a card application. Mobile banner ads were served programmatically and led to mobile landing pages. Mindshare tracked people's activities with cross-device measurement from DoubleClick. Before, one cookie was counted as one user; now, Mindshare and Amex could actually follow along as users moved between mobile and tablet devices to desktops. "Our key measurement KPI is simple: Did the prospect apply for a card in the end?" Passarelli said. Amex and Mindshare Canada found that mobile was a critical touchpoint in many prospects' application journeys. In fact, the number of mobile-driven conversions was 68% higher than they had originally thought. While the most common path to conversion occurred within the same desktop environment, mobile ads often led to desktop conversions. Mobile was the last touch in users' paths for 24% of all cross-device conversions, even though only about 10% of marketing spend went to mobile. And of all the application submissions that came from mobile advertising, 30% were completed on a desktop. By accounting for cross-device activity, Amex and Mindshare Canada were able to discover a 119% conversion uplift for mobile, a 40% rise in attributable conversions overall, and a 37% drop in CPAs. The striking results from this early testing phase have changed how the team at Amex manages its digital mix. Mobile now plays a greater role in their marketing plan and an increased focus has been put on a mobile-first strategy with an increased mobile budget. "Mobile plays a pivotal role in cross-platform conversions, whether they take place in mobile or other digital platforms." Mobile ads are designed to not only support and promote desktop conversions, but also to promote direct mobile conversions. In Q2 of 2016, 28% of all post-view, post-click conversions came directly from mobile. "We have been convinced for a while that mobile is a critical element of the media mix," said Pappas. "However, it wasn't until now that such credible findings confirmed how important mobile actually is as a touch point of convenience among consumers. Indeed, mobile plays a pivotal role in cross-platform conversions, whether they take place in mobile or other digital platforms. This in turn creates the opportunity to tailor creative messages so that their content matches different digital environments." Passarelli concluded, "In the end, we have to find solutions that allow us to advertise where our prospects are. Thanks to DoubleClick's cross-device measurement features, it's clear that our mobile ads are driving efficient conversions."